English ivy is grown as a potted houseplant, a ground cover and a climbing plant with sturdy roots that stick to both walls and trees or other vegetation. 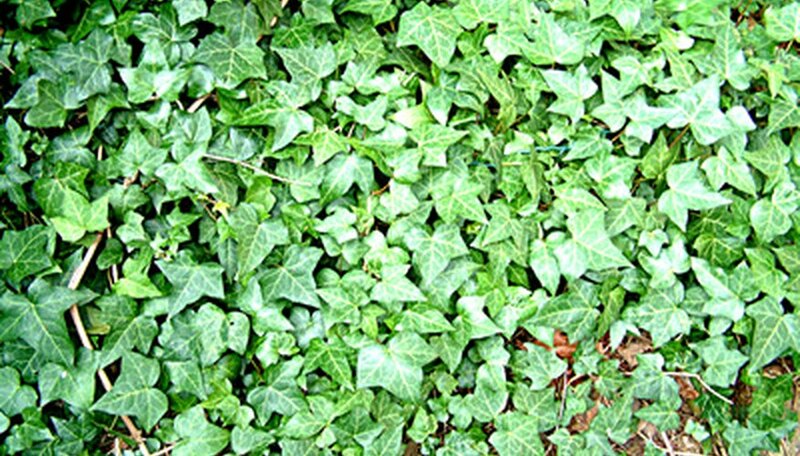 If English Ivy escapes to the wild, it can become an invasive plant that covers the natural landscape, envelopes native plants and smothers them. Because of its hardy disposition and fast-growing nature, English ivy can be trained to grow around forms to create topiaries, or up the sides of buildings for a natural decoration. Purchase a wire topiary form in the shape that you want to train your ivy to grow. Popular shapes include a ball on a stem, heart shapes, deer shapes or a pillar shape. Cover the drainage hole of a large container with pottery shards. Fill the container with peat moss. Insert the wire topiary form into the container by pushing the wire base into the soil. If your topiary is not built with a base that can be pressed into the soil, you can anchor it into the soil using long, U-shaped galvanized fencing staples to hold the topiary form upright. Remove ivy from seedling pots. Dig a planting hole into the soil around the topiary form that is large enough to hold the root ball of an ivy plant. Place the root ball into the planting hole. Cover the roots with soil. Repeat for each ivy that you have purchased until the container is filled. Wrap sphagnum moss around the wire form. Secure in place by wrapping floral wire around the moss. Gently wrap the tendrils of ivy around the topiary form. Prune away any foliage that is against the moss. Leave foliage that points away from the moss. Place the container in a partially sunny location. Water once weekly to keep soil uniformly damp. Continue to wrap new growth around the topiary. Pinch out any dead leaves.